With the latest technology it is possible in just about an hour to lighten up the shade of your teeth 4-5 grades. The Monitek BR-800 bleaching appliance is a LED-lamp which combines 4 different kinds of blue and one red light for the best bleaching result. First we set up a buccal retractor which protects the cheeks and lips. Then a gingival barrier is applied to prevent the bleaching agent from getting in contact with the gums. the substance on the tooth surface. The active molecules neutralize any discoloration resulting from foods, drinks or even tobacco. We re-apply the bleaching material three times altogether to ensure a nice, bright solution and to minimize postoperative sensitivity. After bleaching please try to avoid the consumption of tobacco, colouring food and beverages ( coffee, tea, red wine, spicy food, tomato). 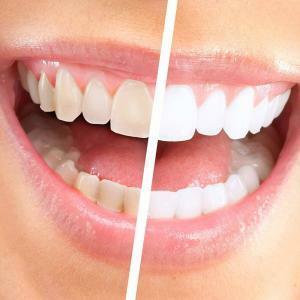 The in-office bleaching is a very safe procedure, it doesn’t harm teeth, fillings or crowns and usually results only in temporary and mild tenderness to cold. It can be repeated every year. Please take in consideration that bleaching requires a calculus-free state, therefore it is possible that a cleaning is needed prior to bleaching.